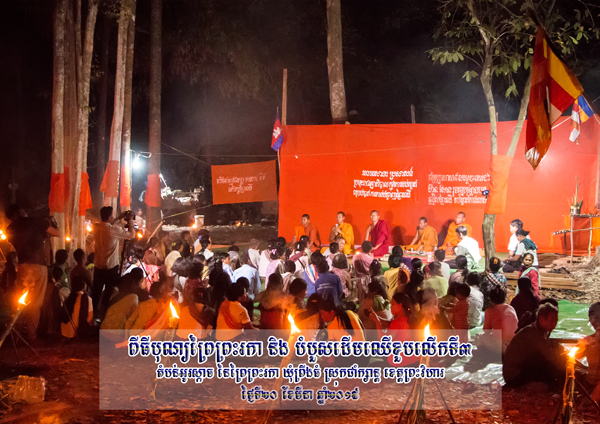 On March 20, 2019 hundreds of people and monks from around Preahroka forest, Phnom Penh and other provinces in Cambodia happened to participate in the Third Tree Ordination in Preahroka organized by Preahroka Forest Community Network (PFCN) at O’skarch, Pring Thom Commune, Choam Khsant District, Preah Vihear Province, Cambodia. Some people might be wondering what Tree Ordination is. Everybody heard about ordinary people are ordained to holy monks, but why should they ordain the tree? As the monk dialogued, the story is follow from the birth of the Buddha. Our Buddha was born under the tree, enlightened under the tree and also nirvana under the tree. Tree as the nature, it protects all lives on earth from disaster and provides non-exhausted livelihood to support human’s life thus we shall pay highest respects to tree. These days trees are facing with destruction caused by illegal loggers. In Cambodia as we are Buddhism we believe that to protect with people patrolling is one way and other way is to protect spiritually by ordaining the trees into religious/holy trees and to put curses on anyone who illegally cut down tree as well. On 18/09/2017, Ponlok Khmer cooperated with Buddhist monks and ex-monks to plant 300 luxury plants in Kg. Thomor pagoda, kg. Thmor commune, Santuk district, Kg. Thom province that were participated by more than 300 students and youths and monks for our memory and for making as nature garden in the temple under the slogan ” having natural forest, having prosperous lives”. In the event, a short forum conducted to make awareness on importance of forest resources that forest does not only provided the shadow, but it provided fresh airs, healthy, protecting stomp and flood and etc…. Forest can grow by themselves but human can not live without forest.